Homemade Cajun Seasoning is a tasty blend of spices that is quick and easy to assemble. Most of these spices you have in your spice cabinet make a delicious blend of spicy Cajun seasoning for so many recipes. Making your own spice blend is easy, inexpensive and you control the flavors! This is an awesome seasoning for chicken, pork, seafood and veggies! The recipe possibilities are endless! 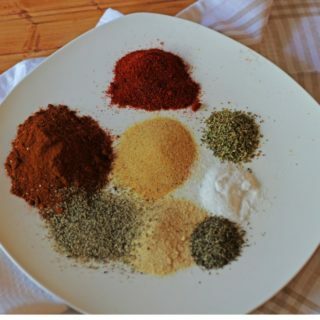 Making your own spice blend is easy, inexpensive and you control the flavors! This is an awesome seasoning for chicken, pork, seafood and veggies! The recipe possibilities are endless! I love spice rubs and the flavor the spice adds to any meal! In the past and who hasn’t, I have bought ready-made spice rubs, as they are convenient! The ready-made seasoning blends have an exorbitant amount of sodium and other ingredients that I can’t pronounce or know why they are in a seasoning blend! Also, most of the ingredients are already in the spice cabinet and it takes just a few minutes to combine and we have an inexpensive spice blend, specifically, Homemade Cajun Seasoning. I make a lot of homemade seasoning blends and I plan on sharing more of these with you because they are so inexpensive to make and truly add great flavor to many recipes. I hope you check out my Homemade Seasoning Salt, which is great as a seasoning for so many things like fish, veggies, and I even add it to salad dressings! My homemade seasoning salt is used to season my Roasted Seasoned Squash Seeds! Since we are bout to jump into Autumn, I hope you try either of these recipes on your pumpkin or squash seeds! Experiment and enjoy! This is the seasoning I use for my Whole Roasted Cajun Cauliflower ! It is a whole lotta Yum! My daughter has been requesting it daily! I hope you like this recipe and make it soon! In what recipes would you use my Homemade Cajun Seasoning Blend? I hope you pin this Homemade Cajun Seasoning Blend to one of your PINTEREST BOARDS! I’d love for you to follow me on PINTEREST! I’m always pinning from talented and amazing bloggers! Feel free to share the love on Facebook, or your favorite way of relating to your friends and family, and please continue connecting with me on Instagram, Pinterest, Twitter, Bloglovin, Google Plus ! 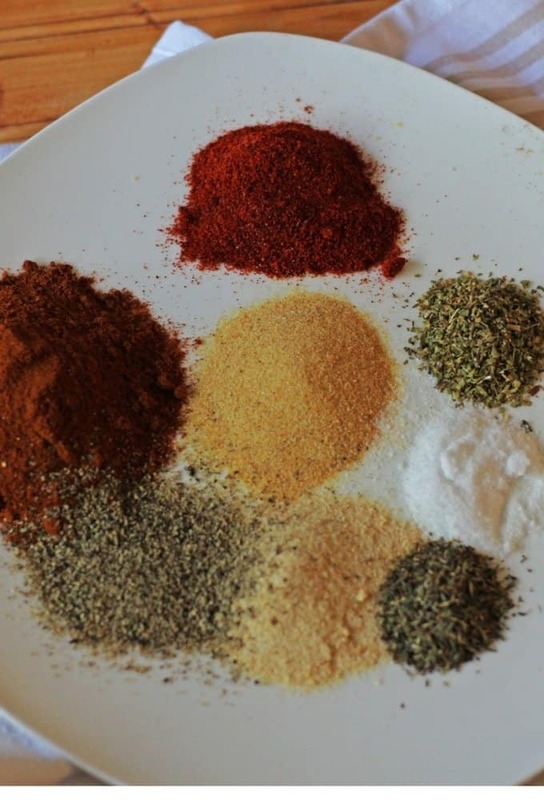 An easy, inexpensive homemade seasoning blend of spices that make a tasty Cajun seasoning. This is delicious on poultry, pork, seafood, veggies, and dressings. In a small bowl, combine paprika, cayenne pepper, ground black pepper, onion powder, garlic powder, dried oregano, dried thyme, and salt. Store in an airtight container. Please note, all nutritional information is an approximation and actually dietary information can vary on ingredients and proportion sizes. This is awesome! I will have to make a big batch and save it for my chicken! I need to make this! I like to make my own blends instead of buying them. This one sounds really good. Great recipe! As a chef, I’m always trying to encourage people to make their own blends, I’ll point some of my clients this way for this recipe! I would like to make my own spices like this because I can control the amount of salt used. Some spice combinations are just too salty for me. My brother would like this Cajun seasoning. I completely agree Yona. I make my own because I can control the spice! My mouth is on fire just reading this. I love cajun spices, so this would be right up my alley. This seasoning blend sounds phenomenal. I need to make it and keep on hand. I do like a nice cajun flavor in my food sometimes. How fun to make it at home yourself! I want the homemade seasoning and it’s more natural. I love making seasoning blends!! This sounds like a good one to make up at home. This is awesome. I love learning recipes like this because it’s better to make homemade blends than to use the store bought ones. This way you know all the ingredients that it’s made with and you get to add or subtract what ingredients you like. I always buy it, so it makes more sense to make it! I have everything I need to do it! ooooh my dad would love this spicy awesomeness. will share with him, he’s all about the seasoning and blending. This is a fantastic idea! I will do my own cajun seasoning blend.